Herff Jones has been providing jewelry to colleges across the nation since 1920. 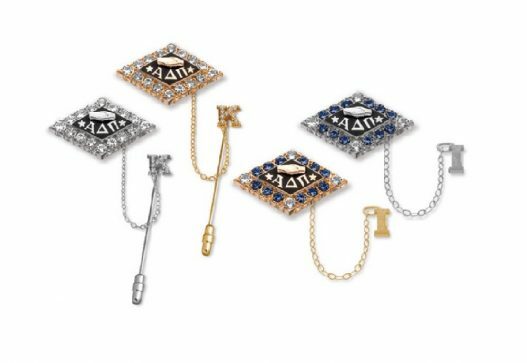 The Greek Division of Herff Jones is the Official Jeweler of Alpha Delta Pi, providing the sorority’s official jewelry, including badges and guards. New or replacement badge and/or guard orders are placed through Alpha Delta Pi Executive Office. The Badge and Guard Order Form is for initiated, collegiate or alumnae members. Alpha members order through a separate badge ordering website. The Herff Jones Badge Brochure displays current pricing and badge options. NOTE: Badge and guard orders require 4-6 weeks for processing after they are sent from Executive Office to Herff Jones. Since your badge is the outward, visible symbol of your lifetime loyalty to Alpha Delta Pi, it is of utmost importance that you wear it correctly. Your badge should be worn with respect for the high ideals and standards of Alpha Delta Pi. When the Alpha Delta Pi badge is worn, no other badge including the guard shall be worn above it. Your badge should always be worn with appropriate “pin attire”: Nice dresses, skirts, and slacks; never wear your badge with jeans or other casual attire. The Alpha Delta Pi badge is never worn with formal attire, except at an exclusive sorority event such as Grand Convention or an Installation Banquet. Herff Jones guarantees our products to be of excellent quality, free of any defects in craftsmanship. Should a quality issue arise with a member’s badge and/or guard within one year of normal wear, the Herff Jones Repair Form can be completed and returned to the badges@alphadeltapi.com to begin the repair process. If issues arise after the one-year warranty has expired, the completed repair form and badge and/or guard can be returned to Herff Jones for repairs. Upon receipt at the factory, it will be inspected and should a repair charge be necessary, the member would be contacted accordingly.